A butterfly garden is no more complicated than any other garden and with a few simple tips you can easily convert a garden area to a butterfly haven or start a new garden from scratch. Butterfly gardens can be as big as you want or as small as a few containers. My passion for butterflies started out of a container that had parsley (among other plants) planted in it for decoration. We were very surprised to find some pretty little caterpillars all over it one day. That started a deep passion for me and over the next several years I converted all my garden plants to butterfly nectar plants and host plants. I still continue to expand the gardens and/or introduce new butterfly plants. Soil preparation is the same as with any garden. Plants vary in their precise needs but in general most plants need healthy soil with a certain amount of organic matter mixed in to grow well. Fortunately, butterflies and native plants go hand-in-hand so you will almost certainly find plants that will grow well in your soil type and are also attractive to butterflies. Since butterfly plants often consist of many native plants, you will find that your fertilizer requirements may be lower. Organic fertilizer is always best but I have had no problem with some use of chemical fertilizer in the soil. Butterflies do not care about the shape of a garden so you can lay out your garden any way you wish: garden plots, foundation plantings, along fences, even containers. Regular garden design applies: plant your taller plants in the back, group plants with complimenting colors if possible and plan to have various flowers in bloom throughout the spring, summer, and fall. Not only is this aesthetically pleasing but your butterflies will appreciate varying heights of flowers and the availability of nectar all through the butterfly season. Also, a variety of different plants/flowers equates to a larger diversity of butterflies. If possible, plan your butterfly garden with some wind shelter. I have butterfly plants all around my house, deck, and yard so some areas are more sheltered than others. It’s never been a big issue for us and unless you live in an area that is consistently windy all summer long, then I wouldn’t let the lack of a windbreak deter you.That being said, shelter is great if you can work it in to your design. Using shrubs such as butterfly bushes (Buddleia davidii, a nectar source) or spicebushes (Lindera benzoin, a host plant) as a windbreak would be ideal. Butterflies are cold blooded and must be warm in order to fly. Many butterflies must have temperatures greater than 65F or higher to fly so they use the sun to warm themselves. It is not surprising then that most butterfly nectar plants are sun-loving plants. When it comes to host plants, there are more varieties that will tolerate some (or a lot) of shade. So, plan your flowering nectar plants for the sunny areas and some of the host plants will fit nicely into your part-shade or shady areas. 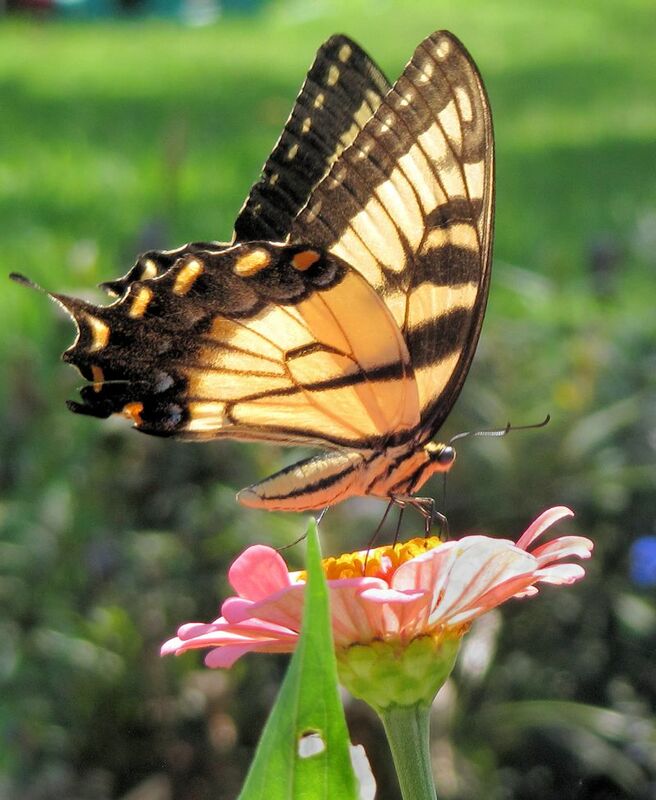 If you can manage to find at least 6 hours of good sunlight in parts of your yard then that will open your choices of nectar plants (and host plants) considerably. If, however, you live in a very shady area then all is not lost. There are some varieties of butterflies that actually prefer shady, wooded areas and not-surprisingly, these butterflies do not rely on flower nectar as their main food source. Instead they are more attracted to rotting fruit, dung, tree-sap, etc. I do not have experience with butterfly gardens in very shaded areas, but if that was what I was working with, I would aim more towards planting the host plants that like shade (Dutchman’s Pipevine, Lindera benzoin), using butterfly fruit feeders rather than relying solely on nectar plants, and trying a few shade-loving nectar plants such as Sweet Joe Pye Weed, Cut-leaf toothwort (Cardamine diphylla), Canada lily (Lilium canadense), and Bee balm (Monarda fistulosa). There are two different categories of plants, host plants and nectar plants, that are important to butterflies. Basically, nectar plants provide the nectar that adult butterflies drink from the flowers while host plants provide the leaves that the caterpillars eat before becoming a chrysalis (from which the adult butterfly emerges). Nectar plants will attract passing-by butterflies while host plants will attract egg-laying female adult butterflies. Having both creates colonies and larger populations of butterflies that stay around. It fulfills the butterfly life cycle and turns a garden of butterflies into the fun and fascinating place that it can be. Our companion article about Attracting Butterflies lists some of the top butterfly attracting nectar plants and a few host plants with which to get started. 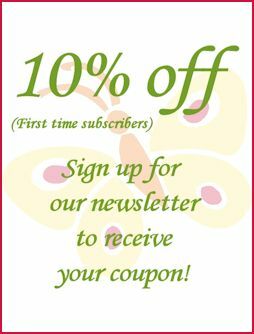 Also please visit our articles about Nectar Plants and Host Plants if you would like some ideas for specific plants that will attract certain butterfly species to your garden. In making your plant choices, keep in mind that the varieties that are native to your area will perform best in your soil/environment. For example, Milkweed has many different varieties that are suited to different areas of the United States and Monarchs will use a tremendous amount of the available varieties. However, I certainly do not restrict myself to native plants and am always ready to try a new butterfly plant in my garden. When purchasing your plants try to buy them from smaller garden centers, online wildlife/nature/organic-type nurseries or grow your own from seed. The reason for this is to avoid pesticides. Growing from seed is the safest but many smaller nurseries can tell you whether or not their plants have been treated with pesticides. I have heard of plants from the big “box stores” killing caterpillars because they are treated with pesticide. I’m guessing the nectar plants may not be treated with pesticides as often as the host plants are simply because the growers of the host plants need to keep the caterpillars off so they have some plants left to sell! So, just be aware that plants from big retailers may be harmful, especially to caterpillars, for a month or more after the purchase. 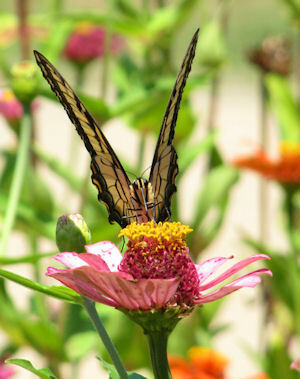 A butterfly garden is the perfect place to go-all-out with extravagant explosions of color! More is better with butterflies and they like group plantings of the same plant (seeds are cheap if you don’t mind raising plants from seed). For example, if you have a package of Zinnia seeds, don’t spread them in different places around your garden, instead, make a large patch of zinnias. The same holds true for host plants. 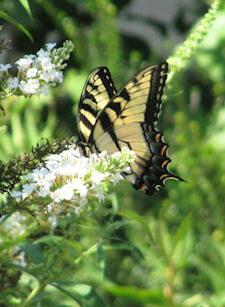 Groupings of the same plant make it easier for the butterflies to see, smell, and thus find your garden. Having stated that larger is better, do not be deterred if you only have a small space. Like I mentioned in the beginning, my butterfly passion started with a parsley plant in a container. So, plant with extravagance whether it is large colorful garden plots or a few brilliant containers. If you are interested in more information and some actual garden design plans, you may want to invest in a book. There are several on Amazon.com, but one in particular that I am familiar with and personally use often as a reference is Attracting Butterflies & Hummingbirds to Your Backyard by Sally Roth. Out of the books I have come across, this is my favorite. Although I am sure there are other good ones out there, this book also comes highly recommended through customer reviews so if you’re interested, you may want to take a look. There are other items that you can add to your garden to enhance your butterfly environment such as fruit feeders, mud puddles, and basking stones. To read more about these please visit our article about Attracting Butterflies. Butterfly gardening is so much fun and so rewarding. I hope this article is helpful and I wish for you a colorful garden full of flying flowers! This entry was posted in Butterfly Garden and tagged Butterfly Garden.